meet at the clubhouse front steps at 6:55 AM every Mon, Wed and Fri (weather permitting: no rain, roads starting to dry out) and following the 5 MINUTE RULE, depart for the ride at 7:00AM SHARP. Rides are dependent on many factors (wind speed, direction, cyclist skill levels, etc.) and might be 8 miles (SBYC to Holgate back to SBYC) to 20 or 30 miles (but hey if you want to bail early go for it). Who Are The Cyclists This Season? For the 2018 season SBYC cyclists have been Dave Draper, Cary Reimer, George Russo, John Hoch, Brendan Monaghan, Pete Bruder and Joe Blazewicz. All SBYC members and their guests are welcome. Recent biking participants have been mostly men this past 2018 season. Women are always welcomed and encouraged to participate. SBYC women have ridden in the past and of course are always welcome as well as friends and relatives of SBYC members. We encourage anyone interested in SBYC Bicycling and who has questions to contact any one of us for ideas and info as to what to expect or how to prepare. What does a beginner cyclist need to know/do/bring? Motive for most if not all the SBYC cyclists do so for health maintenance and/or socialization reasons. None of the rides involve racing and we typically stay together as a "pack" for additional safety and discussion reasons. Nobody gets left behind. 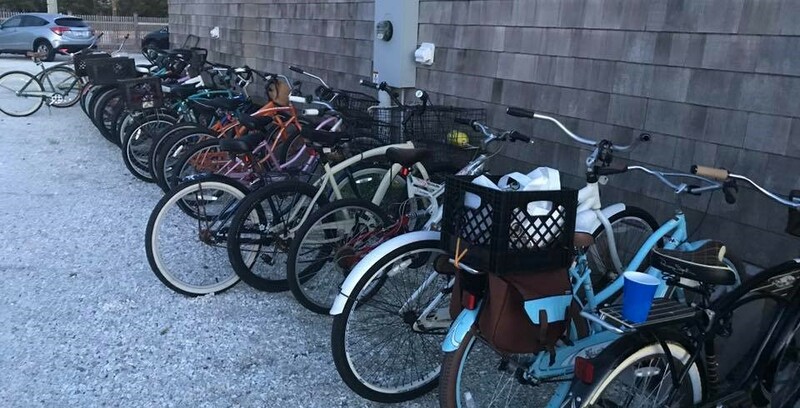 Most (90% or more) of the bike rides are on LBI and start at the SBYC club house. 2. Call, text, email or talk with any one of the cyclists mentioned above for a discussion about your questions on how to get started. Any new starter will be accompanied by at least one or two of the "regular" riders mentioned above for your entire ride (most likely all the "regulars" will participate with you) starting that day for a 0 to 8 mile beginner paced bicycle ride. Basic peloton group riding safety procedures will be discussed/followed to see that you get safely back to the clubhouse. Please bring a functioning bicycle of any type and bicycle helmet for safety purposes. You can then decide to go further at that time or wait till your next visit. All the "regulars" mentioned above love bicycling on LBI and are really eager to help newcomers. The "regulars" typically arrive at the club by bicycle but feel free to transport your bicycle to the club by auto if that is more convenient for you. It seems like every one of the "regulars" will speak enthusiastically for the health benefits of regular bicycling. Planning and arrangements for "off LBI" rides are made typically during the M, W, Friday regular ride times as all of our "meetings" are held while biking! No meeting rooms for us! Another "first SBYC cycling event" in 2018 included several members and friends that rode along well designed cycling paths along the rivers around New York City!